A lot of times we hear hype about a certain material, metal, or product. Of course, that’s just marketing coming from the manufacturers and people behind the item in question. However, when it comes to the benefits of aluminum products, there’s no need to play it up or exaggerate the claims. The truth is that the use of quality aluminum alloys through standard or custom aluminum extrusion provides consumers, manufacturers, professionals, and the planet as a whole with many very distinct advantages. There are many reasons to work with aluminum fabrication shops for your next project. Everyone is concerned about the planet, so the best way to reduce greenhouse gasses and energy consumption in the production of consumer products and components is to use an environmentally-friendly material. Aluminum is super friendly to the environment. Not only is it one of the most plentiful elements on earth, but it can also be recycled repeatedly without losing any of its inherent properties. It is completely recyclable and 100 percent non-toxic. While the initial mining of aluminum is similar to the mining of other metals, the recycling process to melt it down, create aluminum billets, and then use it for standard or custom aluminum extrusion requires just a small fraction of that energy to create. For projects that are on a tight budget, there’s nothing quite like aluminum to fit the bill. Because it is so plentiful and highly recycled all over the world, aluminum is very cost-effective and is a great way to increase value without investing more in materials. It is also very easy to work with, which can significantly reduce tooling and labor costs. Custom aluminum coating solutions are also easy to add at aluminum fabrication shops, including powder-coating, painting, and anodizing for an extra hard and protected finish. Another clear advantage of working with aluminum is that it is ideal for projects that require close tolerances. It can be used to create very complex shames through the use of custom aluminum extrusion, and it can even be cut to very exact specifications to reduce waste and eliminate many secondary operations. 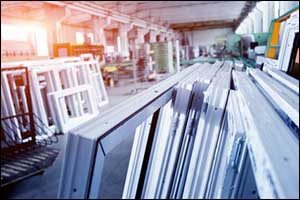 Industries that depend on high precision, such as military and defense, electronics and computers, or even medical instruments and equipment, take advantage of these benefits of aluminum products more and more each day. When you work with aluminum fabrication shops like Silver City Aluminum that can design and engineer custom aluminum extrusion profiles for clients to meet their exact specifications, you really have the opportunity to make the most out of the material. You can create just about any shape that you can imagine when you use aluminum extrusion. Additional operations can be added to further customize the function, look, and feel of the finished product, further reducing labor for the manufacturer and making assembly even easier. Many industries are now using custom profiles to create innovative and even ground-breaking parts to take their products and equipment to the next level. For projects that require special performance features, aluminum is also the best choice. Aluminum is a good conductor of electricity, yet it is not magnetic and will not spark or combust like other metals. It is also an excellent conductor of heat. In addition, custom aluminum extrusion is also very strong and durable, which means that it can be used for structural purposes as well as to create a safe housing for sensitive equipment. The natural reflective nature of aluminum also makes it a great choice for many industries who require thermal management. It’s anti-corrosive nature also makes it a great choice for outdoor applications and for use in corrosive or abrasive environments. It even gains strength in cold environments, making it an excellent choice in areas where steel might become too brittle. If you are interested in working with our team of engineers to take advantage of the benefits of aluminum products within your industry, give us a call at 508-824-8631. Our team will work with you every step of the way, from the initial design to the delivery of a finished product. Make sure to ask about our lead times, which are a fraction of the industry standard. Because we do everything in-house at our one-stop aluminum fabrication shops, we maintain a high level of quality control and are able to reduce lead times considerably. Call today or use our online contact form to get started on your order for custom aluminum extrusion right away.